3-D Monster: Meet The New Guy From The Upcoming Season 4 of The Walking Dead! Meet The New Guy From The Upcoming Season 4 of The Walking Dead! This morning saw the release of Entertainment Weekly's next cover story, season 4 of "The Walking Dead," and we got a good look at some of the returning characters and a little bit of information on a new threat. 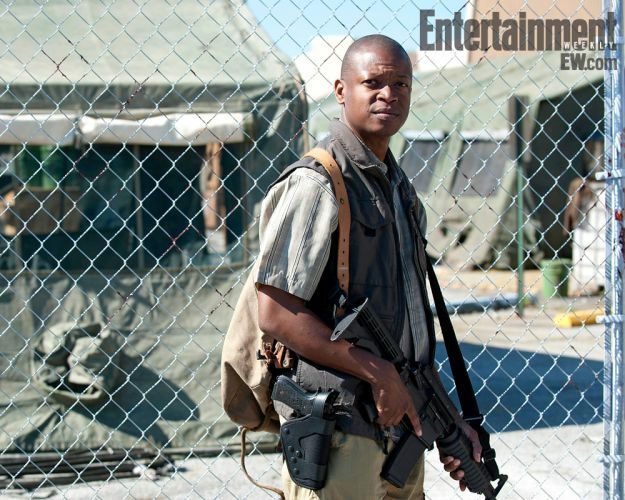 Now, EW has debuted the first official image of one of the new characters in the series, Bob Stookey, as played by Larry Gilliard Jr. Described as a "former Army medic," Stookey's name should be familiar to fans of the comic book series and prequel novels, but he will be undergoing some changes in the show. Instead of hailing from Woodbury and working for the governor, Stookey will instead be found by Daryl Dixon about a week before the events of season 4 start.